For your SFM question please see attached image. I have a feeling you are using a ballnose endmill with DOC less than the radius of the tool. 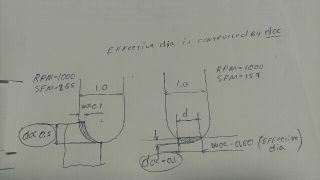 In which case effective cutting diameter will be less than 1.0"
Effective Diameter is controlled by DOC alone. So far there is no dedicated chip thinning calculator, but chip thinning is calculated internally and applies when chip thinning box is selected. A dedicated thinning calc is in the works. shouldn't unchecking ballnose make the corner radius 0. if its zero that would mean it's a square endmill? is the corner radius used only with ball nose endmills or can you use it with square endmills with radius? On my Desktop app it does that, but it is hard to keep things consistent considering those are two completely djfferent languages. I will make it right in the next update. Yes you can use corner radius for bullnose cutters. This is the main reason for that field. All "Ballnose" check box does is forsing corner rad to be half of cutter diameter. then if I chnage my DOC to .2 it change WOC to 1. What's the program trying to do? As you noticed the program is very different from most other calculators out there. Each tool comes with a set of defaults to it. Those include default length, flute length etc. Default values are the ideal ones they are masked with yellow color. Any deviation from ideal cuases things to change. To reset any input to default, click on the label to the left of the field. Now. Milling tools come with default DOC and WOC. (depth and width of cut). When you change the tool srickout to for example 4x the diameter, default DOC will reduce considerably. In other words it is suggesting you a new depth of cut for extra-long tool. If you enter your own larger DOC, FSWizard will try to reduce the feedrate to compensate. DOC and WOC are linked together. If you decrease the DOC, woc will increase. And wise-verse, increaese in DOC will cause WOC to decrease. This is called cut balancing and is aimed at achieveing constant tool load under different cutting conditions. One last example: if you decrease tool load (decrease WOC/DOC or both) from default values, calculator will try to increase the feedrate on softer materials. Also various materials will suggest different DOC. It is sort of trying to Calculate all possible variables and come up with optimal Speeds and Feeds that will not break the endmill. I recommend to use speeds and feeds as is, but on the machine always try to strart with lower than suggested depths of cut. Until you gain confidence in your machine and tooling. IE. Sometimes it would produce results out of my machines capabilities (gotta watch HP value) but my customers with stronger and more rigid machines manage to get even higher material removal values. If you have a PC try my HSMAdvisor calc. It has machine profiles, watches cutter deflection, spindle power and torque, saves tooling and cuts and is the most fail-safe tool out there. what it is calculating. With the above example. If I have DOC .1 WOC 1. Starting point. Both values are default for this tool type. THEORETICALLY a tool will be able to make the cut. You change (decrease in this case) DOC to whatever number you want. Also (screenshot does not show, because i forgot to set corner rad to zero) Fedrate will increase slightly, because now we are removing less material. You set both DOC and WOC to 0.1 - it is a light cut. If there is any room to increase the feedrate, it will try to do so. Hence it allows you to take much deeper cut. Basically you set one field to your custom number, and then by taping the label on the other field you cause that other field to re-balance ACCORDINGLY. If you take bigger cut, feedrate will reduce. and if you take lighter cut, feedrate will increase. I hope this would help you out.